Thoughts on advertising, branding, design, and technology. To continue the "Where in the World is Matt Lauer Tour," NBC has kicked-off a Web spot that shines new light and experience for online visitors familiar with the Today host. 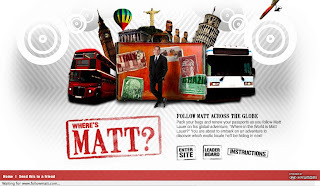 Using a fun passport interface, the site encourages people to explore Matt's desk to interact with the show host's video iPod playlist, download themed ringtones for their mobile phone, and see all of the places Matt has traveled to around the world. 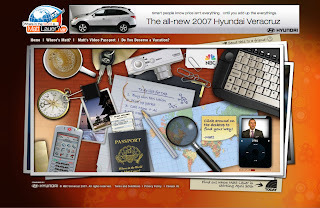 Promotion is provided by Hyundai, and site visitors can even upload a brief video clip explaining why they deserve a vacation to travel. Overall, the Web experience is great. 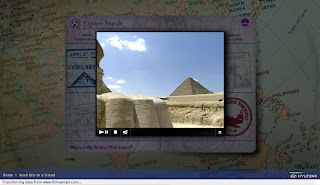 The site embraces the dynamic travels of Lauer using an entertaining touch point that provides a comprehensive resource for the world's wondrous destinations. However, the execution of this site's design feels a little disjointed. Several components of the site launch in separate windows making the experience feel less contained. Even though I feel a more controlled experience for visitors is needed, the site really does a nice job of pushing the celebrity brand to attract further following of this tour. More tracking of Lauer and his experiences seems to be inevitable. The tour and promotion has been going on for a couple of years now (not sure of the official date that it began), which indicates that viewers are growing their connection with the host and all that he encounters. This entry was posted by cam, on 4/09/2007. I'm Craig, an obsessive consumer of media, technology, pop-culture, and all things related to advertising. This is where I occasionally write short thoughts on things that catch my eye or I otherwise feel merit a little discussion. 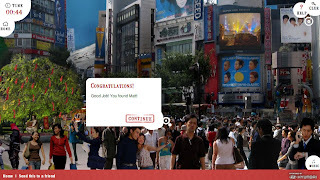 Want a link to your blog or site on Brand Appeal? Get in touch. Brand Appeal is powered by Blogger. Theme is designed by Oinam.